The fourth day during London Fashion Week is a difficult one. The collections in September weren’t as powerful as the previous days, on face value. My thoughts percolated and I’ve grown to like most of them. With 11 shows to get through, it’s almost impossible for me to review all of them, without inundating you with larger brands. However, there are certain designers that I hold a special place for on that day. There’s Erdem and Christopher Kane, another is Roksanda. Roksanda Ilincic has stood the test of time in London and her collections are sought after by, none other than, Samantha Cameron - who was perched front row. You can see why women would be taken by the looks featured in this collection. They’re certainly not your typical ladylike garb. 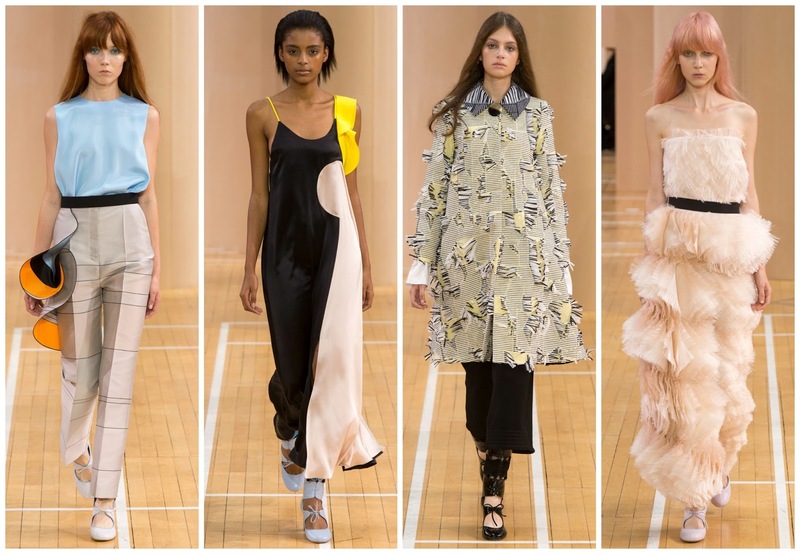 They possess an artful flair—art being a them Roksanda chooses to reference. Roksanda's venue of choice: the Seymour Leisure Centre, once again hosted her show. Last season, an installation by artist Gary Card was erected in the sports hall. The London-based set designer returned for spring 2016, offering an insightful look into what was to come before the collection even hit the runway. A maze, constructed from MDF, lined the catwalk; models weaved in and out of the structures. Ikebana, the Japanese art of flower arranging inspired the designer this season. The asymmetry and empty space present in the arrangements was particularly on Roksanda’s mind, which echoed the set created by Card. There were layered skirts, and dresses. Artistically, there would be circular cutaways. One yellow coat came alive with floral-esqe 3-D trimming. Ballet also infiltrated the collection. The floaty nature of the looks combined with Tabitha SImmons-designed heels, the theme pleasantly juxtaposed against that exactness of Ikebana. The free against the constricted. A black and sand pink dress with a buttercup yellow accent was the epitome of a ballerina’s grace. The yellow dress with cinched sleeves and the orange and blue dress also exuded that serenity. Though too bulky for a ballerina, the finale looks, comprising of three layered organza pieces, were magnificent on the models. There was a black skirt with a yellow accent, a yellow dress, and most beautifully a pink strapless number (the one that was all over Instagram). Roksanda is cementing a place for herself on the borderline between conceptual and glorified ladylike wear. The details must be tweaked but she is almost there, establishing a new footing in the overcrowded London market. In the time being she’ll continue to create luxury pieces that stylish women will want to own.